We are very proud of our Patriot Series rods: an economically priced, no frills, cane rod. 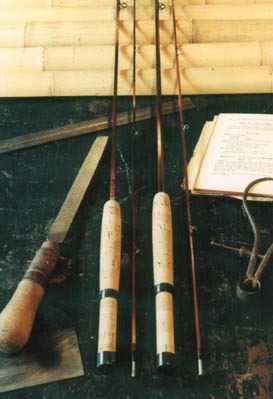 The intention of this line is to provide a high-quality, fine casting tool for those desiring an introduction to the exceptional qualities of cane rods. 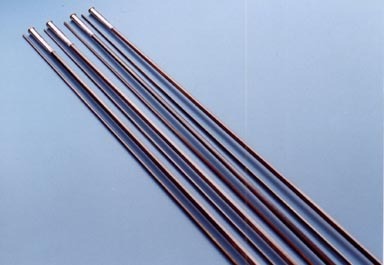 These rods are single tip flamed cane rods, finished with a proprietary hand rubbed, penetrating, polymer finish for low maintainence, and available in 2-piece or 3-piece models. From time to time, we may have Patriot rods available in Quad and Penta design. Please inquire. The rods have a modified cigar grip with highest quality CSE oxidized nickel silver ferrules and nickel silver reel seat hardware, with forest green color-preserved silk wrappings. Complete with a cloth bag and aluminum case, our Patriot Series rods carry the same lifetime guarantee in materials and workmanship as our Signature Series rods. These rods have a crisp, responsive, dry fly action. Extra tips: $400/$300 for 2 and 3-piece rods, respectively. Just to let you know, my Patriot goes to "work" with me almost every day during the field season and I have logged MANY hours on the stream with it. It has caught over a dozen species of fish with me and is still straight as an arrow and I really believe is just hitting its stride. I'm pretty sure it will be around longer than myself. I only own a couple rods and it is basically the only rod I fish with unless I'm in a canoe. It would be nice to have its larger cousin to tackle tailwaters with weighted flies and the occasional small mouth bass. Thanks and take care. The same models available in our Patriot Series rods are also offered in blank form for those wishing to finish a rod to their own taste. These single tip blanks are ferruled and finished with our low-gloss, hand-rubbed finish. $475 Plus shipping, insurance and taxes. !!!!!!!! Special Offer !!!!!!!! Order any J.D. Wagner flyrod with a Hardy reel and we will fill the reel with backing and a Cortland 333HT DT flyline for FREE!!!!!!!!!!! © Copyright 1999,2000, 2001, 2002 , 2003, 2004, 2005, 2006 , 2007 J.D. Wagner,Inc. all rights reserved.